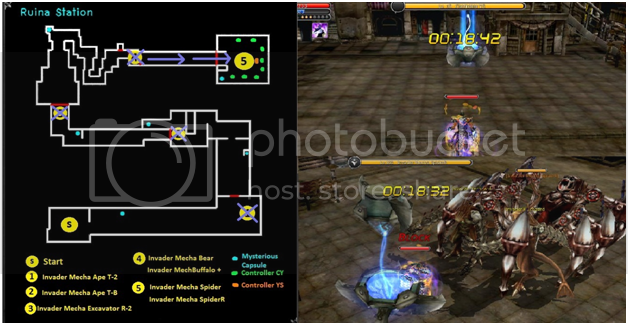 Last time I have given you guys a glimpse on how does a CABAL dungeon looks like in action. 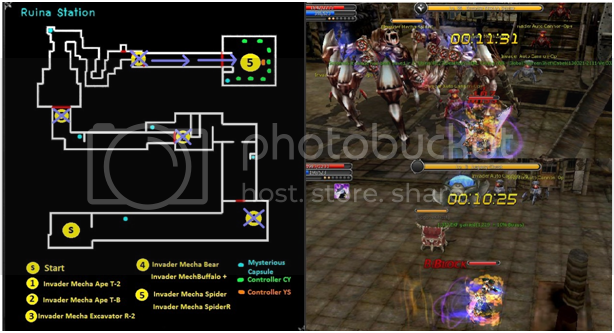 Now, I will be providing a guide on the second dungeon that you may enter when you reach level 45. This is the Weakened Ruina Station or at level 75 Ruina Station. The dungeon is somewhat similar with the Lake in Dusk though this has a smaller map thus the objective is to defeat the boss monster to continue to the next one. No riddles yet just pure muscles! There are also Quest Capsules that are available for this dungeon. You may want to get these first before entering but you can still use a capsule even inside. I will now start my guide, guess I have already informed you that much about the things that you need to do. 1. Move forward and kill the first boss, INVADER MECHA APE T-2. 2. After killing the first boss, the gate towards the next boss will open. Proceed to the direction in the map and kill INVADER MECHA APE T-B. 3. Another gate will open after killing boss INVADER MECHA APE T-B. The next boss (INVADER MECHA EXCAVATOR R-2) is quite strong you may need Battle mode or Battle aura. 4. 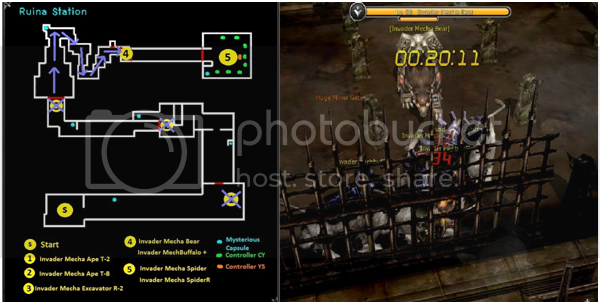 You can now proceed to the next boss (INVADER MECHA BEAR), but you will need to kill first INVADER MECHBUFFALO +. Do not hit those little stones because it will summon more INVADER MECHBUFFALO. After killing INVADER MECHBUFFALO, gates will close and if you are not inside the area, there’s a portal near the gates. 5. After killing INVADER MECHBUFFALO+, INVADER MECHA BEAR will appear. 6. Now that you kill INVADER MECHA BEAR, the gate for the final area will open. 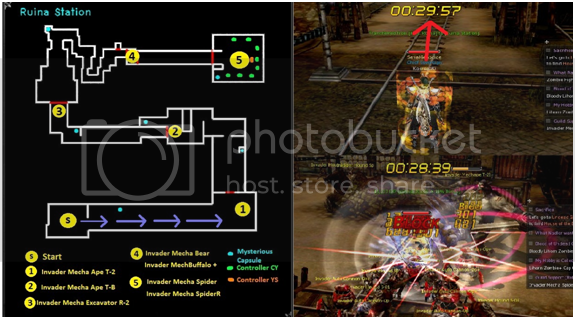 Destroy the CONTROLLER YS in order for INVADER MECHA SPIDER R to appear (Note: This spider will re-spawn three times). 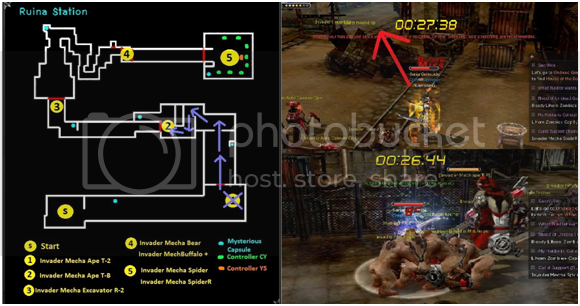 After killing the first INVADER MECHA SPIDER R, Auto – Cannons (Boss minions) will appear, you may kill them while waiting for the second INVADER MECHA SPIDER R to re-spawn. 7. After killing the second INVADER MECHA SPIDER R, Electric Birds will appear these mobs are hard to defeat. In order to kill them, you need to destroy the CONTROLLER CY located in the map below. For me, base on experience the CONTROLLER CY are tough to beat too when doing solo. 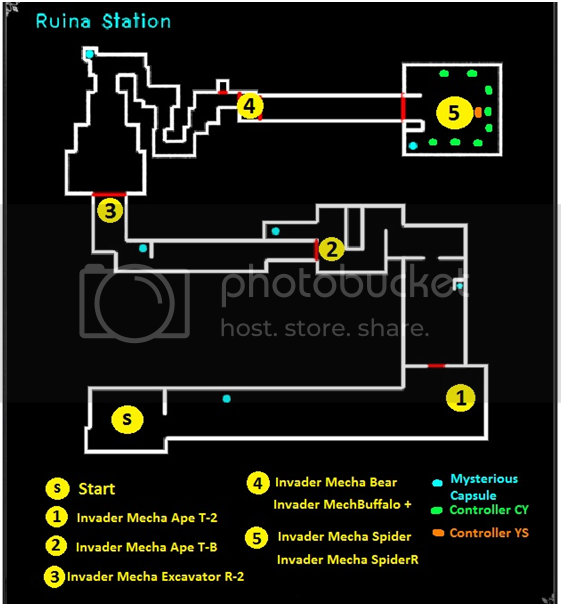 So, unless you’re having problems you may want to disregard in destroying those and just wait for the final appearance of the INVADER MECHA SPIDER to finish the dungeon. 8. 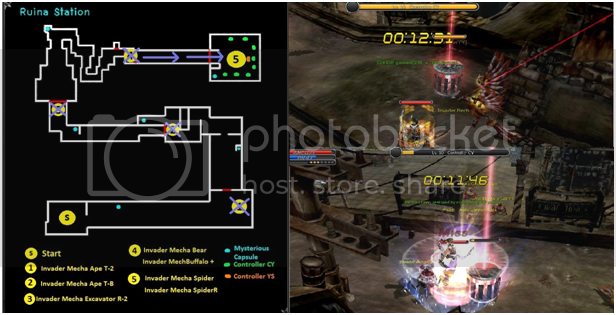 Finally, INVADER MECHA SPIDER will appear, kill it and destroy the chest then you are now through with RUINA STATION MISSION DUNGEON. 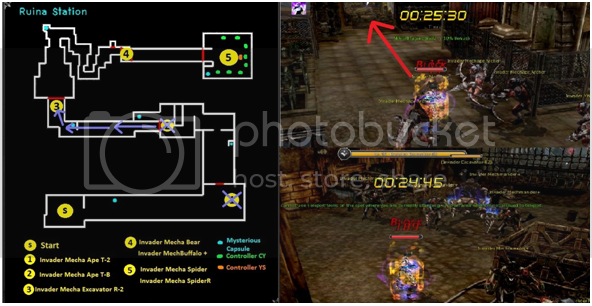 I will also provide a video demonstrating my run on this dungeon (Note: I have skipped the part where I was battling the boss monsters, the purpose of the video is to show you the right way on how to finish the dungeon). Hope that this guide will help you progress inside the game.